This lake is situated in the northern Lazio, in the main caldera of the volcanic group Vulsinio, it is an elliptic shape. With a surface of 114.5 square km., max depth 151 m . and a boundary of 43 km . ; from it emerge two isles: Bisentina and Martana, probably residual volcanic products. It is mainly fed by raining water and there are numerous tributaries with just one effluent: Marta river that has its source from the port of the homonymous village and it flows into the Tirreno sea. On the fertile shores, in addition to oak and chestnut woods, alternates farming of vines, olives and vegetables. Among the various tourist attractions, the below mentioned are those with a cultural and archaeological purpose; as a matter of fact on the lake's shore followed one another the Villanoviana, Etruscan and Roman civilization, while the medieval period left its important mark in the small near villages. Also the customary villages' festivals and the cookery are very interesting; many people instead choose the lake simply to have amusement practising sailing, windsurf and fishing. 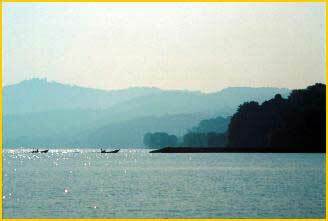 The volcanic lake, the greatest of Europe and the 5th one for its dimensions in Italy , is a few km. North to Viterbo. A road 60 km . long surrounds it with a breathless panorama. The lake's origin begins when the Vulsinio volcanic group, following some lava eruptions, empty out and fall on itself creating a big caldera that will be then slightly fill up by water. The lake's bottom is very irregular with many roughness while the two beautiful isles, the Bisentina (0.17 square ) and the Martana (0.10 square Km), both full of mediterranean vegetation, contrasts the azure colour of the surface. From the late archaeological discoveries, we realize that the lake's level changed in the corse of the centuries and it surely remained 294 meters for a millennium long like the subaqueous ruins of the Bronze Age's settlements demonstrate us. Then, about three thousand years ago, during the Iron-Age, there was, because of unchecked grounds, a quick raising up until the highest level from the natural point of overflowing (incile) that was at 306 meters , then reducedto 303 meters by the Etruscan to get back the agrarian flooded spaces by removing a rock's buttress that was blocking the river's route in the locality called "sasso tagliato". The today's level of the lake is established by the masonry "incile" and by sluice-gates of regulation, situate 303.41 meters high in the port of Marta at the beginning of the homonymous effluent. The prehistoric man left firm and unequivocal marks of his presence, from Neolithic till the iron Age passing through the Bronze one. Important "Villanoviani", then Etruscan centres were Visentium (Bisenzio) 2 km . West from Capodimonte and Vezna, that will be the roman Volsinii, then Bolsena. After the Etruscan, the Roman, the Barbarian invasions, the Church and the aristocracy, the Farnese family marked the recent history of this area. In Bolsena lake are visible the so called "sesse", that are unexpected changes of the inner water's level, very similar to tides but determined by the atmospheric pressure or by the winds; about 50 cm . "sesse" have been registered. Furthermore, more frequently and visible from the coast, there is the "anomaly wave", originally inexplicable, it presents itself very big and quickly increases strongly till breaking down on the coast. The fishes in the lake are still numerous in spite of the professional fishing and the wrong scattering of infesting fry; the eels, already known by the Roman, are quoted by Dante in the Divine Comedy. Further than these fishes, in the lake nowadays are: Coregonus, luces, perches, trout perches, carps, scardola (here wrongly called lasca). And at the end the little latterino, always quarry of pillager fishes or aquatic birds. The presence of aquatic birds, especially migratory, is high because of the feed's abundance and the protection given to them; it's fantastic for the people who love bird watching finding a paradise near to home but for the fishermen is a trouble. The fishing boats are very peculiar and always the same from a long time ago; they have asymmetrical oars, the front one only propulsor, the back one acts interlocking also as steering-wheel and the fishermen use them standing. Nowadays the oars have been replaced by little engines; the first one was born on July 23th 1884 when a steamboat was been launched from the Bolsena's dock.